We all have a “go to” dish we have perfected to our liking over time and repetition. Perhaps if you have been checking in with this blog you would guess mine would involve pasta. Cottage Grove House is still very new and there is already sixteen pasta recipes posted. 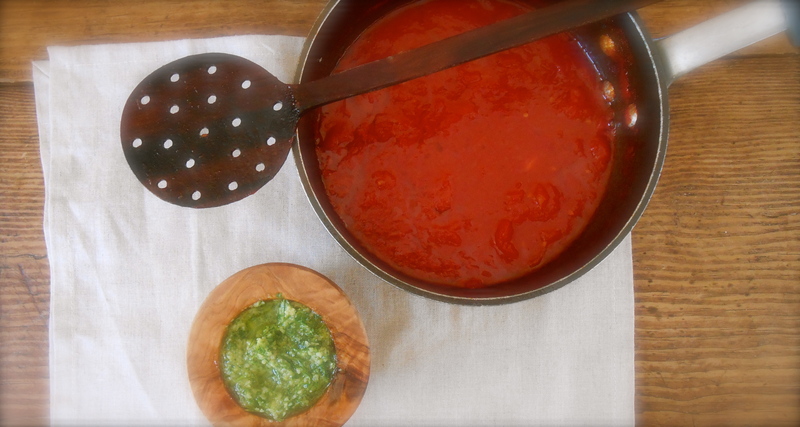 Today’s recipe is my “go to” pasta sauce. When it seems as though there is nothing to eat or prepare in the kitchen I always find some parsley in the crisper (or in this occasion the garden) and a large can of tomatoes in the pantry, perfect to make both pesto and tomato sauce pasta. Our parsley plant needed a trim so I decided to make a pesto for lunch. I discovered cutting parsley off the plant and promptly using it certainly intensifies the flavor of the pesto. The freshly cut parsley really gave a distinctive flavor to the sauce, as though the herb was still very much alive. For no particular reason I chose to leave out any type of nut for this pesto. And using penne regate pasta was a very good idea seeing that the sauce found it way deep into the hollow center, as well as holding to the exterior ridges. Put a large pot of water on the stove over high heat and bring to a boil. In the meantime, heat 1/4 cup of olive oil in a saucepan over medium high heat. Add the crushed garlic and cook until aromatic. Carefully add the tomatoes, and break them up with the back of a wooden spoon. Bring to a gentle boil, turn heat to lowest setting and simmer, stirring occasionally. Put the parsley, parmesan, garlic, and salt in a food processor and pulse for a few seconds to combine. Scrape down the sides of the bowl, then pulse again. Drizzle in the olive oil while the machine is running just long enough to incorporate the oil. Set aside while waiting for the pasta to cook. Once your water is at a roaring boil add a tablespoon of coarse grain salt and drop your pasta in. Cook until al dente, penne regate cooking time is approximately 9 minutes. Drain the penne and return to the pot. Toss with the pesto sauce until well coated, then pour in the tomato sauce and continue to gently toss until well combined. Looks amazing Seana! I love pasta too, and it’s nice to have a go-to sauce when you don’t know what else to eat! Love the idea of that pesto. Must try this. Thank you! you don’t use nuts in your pesto?? This sounds like a fantastic go to pasta sauce. The picture alone is making me drool ;) I also like your take on pesto, sounds yummy! Thank you! :) So easy and delicious…how can you not “go-to”…right? This looks delicious. Very wholesome. My go-to is herb-crusted salmon. I like to use fresh cilantro when I can. Wow! Salmon as a “go-to”! My hub would be so happy if Salmon was my go-to! I have told a few friends about your Ajo Blanco. I’m still thinking about it! Aw you’re so sweet. I just put the salmon in the oven for 30 mins after covering it with herbs and mustard or Peruvian hot sauce and voila! A meal! Giorgio Locatelli woud be very Proud of this dish ;-) looks delicious again! Looks so delicious. The parsley pesto sounds so fresh and delicious, I love the idea of making it without nuts. I will have to give it a try! Thank you Danielle! :) I like your new blog look! Hope you get a chance to try this tomato/pesto sauce pasta. We had penne last night, but not as beautiful as yours! I love the pesto, tomato sauce combo! I bet your penne was amazing Fae! What sauce did you make? I’m curious. Love this dish! I’m intrigued with the tomato sauce and pesto combination. Looks delicious! Thank you Anne. The tomato and pesto fit together quite well. Very simple and so delicious. Hope you’ll try it sometime. I’ve been on a pesto kick lately, trying all sorts of variations – your parsley concoction seems absolutely delicious! I love pesto too and make it quite often as well. :) Not only for pasta but tossed with vegetables. So good. I love your pesto dish. Lovely photography indeed. You can never have too many pasta dishes in yourcollection, as far as I am concerned. Each tastes different and delicious. This looks like a great recipe to add to my collection. It’s true, ever enough pasta recipes! One reason for starting this blog was to get the recipes out of my mind and written down. This is a good one, so simple and requires so few ingredients. Snap. Pasta is our go to dish as well. I make something very similar. My family has dubbed it Pasta Tri Colore – tomato sauce, basil pesto and crumbled ricotta. Pasta Tri Colore sounds great! Ricotta….nice! You make yours homemade too don’t you? Mostly. Unless I have visited Paesanella, a specialty cheese shop that makes their own. You can buy it fresh and warm from the counter. Making your own takes about 20 mins if you like soft curds. I really love the pesto tomato sauce combined on the pasta. I also really like that you didn’t add nuts. I actually prefer the pesto without. I’ve noticed I too prefer pesto without nuts lately. I do like walnuts better than pine nuts in a pesto, but really I am not so sure it is necessary. Isn’t that strange! I wouldn’t have thought to combine both. And of course it’s going to taste great. – Really must do another pesto as my Greek style basil is looking like my hair – needs a trim. Just like your parsley. Yes, nothing better than using freshly picked herbs, even those in pots on my south-facing window sill. So much more flavour. – And loving that cute littl’ mortar! haha. Yeah, my hair could use a trim too! :) Couldn’t quit eating this pasta. Actually kept scraping the side of the pot and eating the sauce by the spoonfuls! Season is starting to change and time to really use the herbs up before the cool wet weather shows up. And yes, the mortar… I love mortars and have had to downsize to a small, medium and large size only after my collection started to get out of control. Yum! Pasta is such a great go-to meal :) I wish I had fresh herbs and veggies- that always makes it easier! You are right, the herbs out back have really added convenience and just the availability has been a reminder to use them more in my cooking! This is the first year I planted so many different herbs and it really has become a necessity from now on! Gee… seeing this beautiful pasta dish REALLY makes me miss my pasta! I swear, I could almost taste it!! Yum and so fresh! I love pasta but deny it to myself (to make up for all my other carb guzzlings) so will use your post as occasion to give myself a treat. 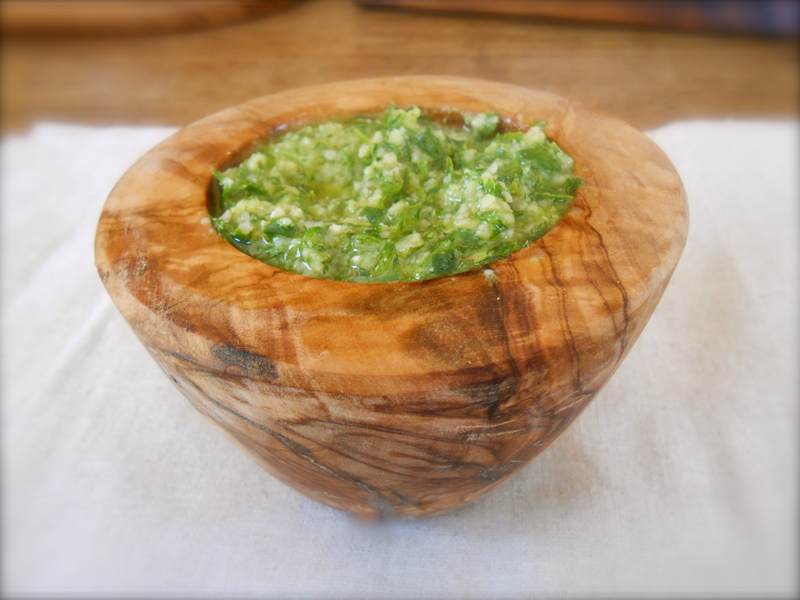 On the superficial side, just love your beautiful wooden pesto bowl. :)… not superficial at all! Pasta is my carb downfall. I can do without anything else…but NOT my pasta. This is a great “go to” recipe. I can’t wait to give it a try! Oh yes! Using your own fresh tomatoes would be great! You will need to peel and take the seeds out of the tomatoes first. I was just looking online at various techniques to make this easy. My tomatoes are finally ripening and I’m going to be peeling many! This sauce I make is very simple. You could get a little more elaborate with the tomato sauce itself. I think the pesto really adds so much flavor so I keep the sauce pretty basic. This looks great. I’ve never tried making pesto with parsley, it sounds refreshing. Hello! And thank you for stopping in. You have a wonderful blog and I’ll be checking in with you often. Do try pesto with parsley…it’s very good! My dinner for tonight! It looks pretty fabulous & appetizing too! Yum! 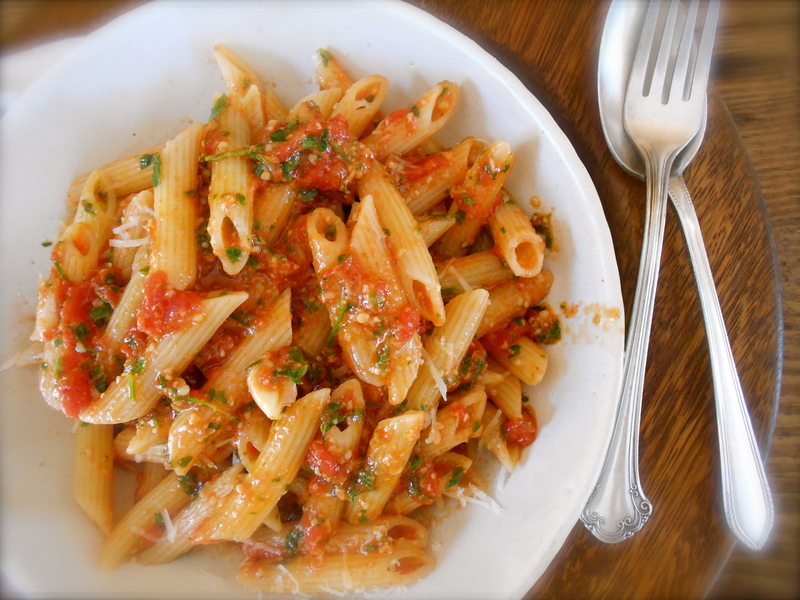 You are currently reading penne regate with garden fresh parsley pesto and tomato sauce at COTTAGE GROVE HOUSE.